The Hohokam were one of the United States’ first great Native American civilizations. They inhabited parts of southern and central Arizona near the Salt, Gila, Verde, Santa Cruz, and San Pedro rivers from around the year 600 to around 1450 AD. The Hohokam were one of the first tribes in Arizona to give up the hunting and foraging lifestyle. They built a society around irrigated agriculture that was watered by elaborate canal systems they created. The Hohokam were Arizona’s first farmers. For their time, the Hohokam were the only culture in North America that relied on irrigation canals to water their crops. The Hohokam lived in the dry desert, which means there was not enough rainfall alone to grow crops. In order to meet their needs, they created highly sophisticated and large irrigation systems. The canal systems allowed the Hohokam to farm corn, cotton, beans, tobacco and squash. They were skilled farmers and would manage the soil to replace lost nutrients. The well-designed irrigation systems allowed the Hohokam to produce two harvests each year. They did have other food sources that came from dry farming agave, the gathering of wild plants and hunting deer and other small animals. However, life for them focused mainly on agriculture and the growing of their crops. The canals would take a lot of organization and the labor of thousands of people to build, operate and maintain. The farmers would have to maintain their fields and make sure the irrigation gates were opened and closed the appropriate times. They also would have had to protect the crops from birds and rabbits and other intruders. Harvest and planting times would have required the efforts of their whole community. The Hohokam were the earliest cotton growers in the Southwest. They would weave their cotton into textiles which were often used as a trade items. They would trade with the Indian nations of California and also those in Mexico. The word Hohokam is a Pima word given to the civilization by archeologists. It means either “those who have vanished,” or “all used up,” or even “those who came before.” For three centuries leading up to the disappearance of the Hohokam there were several social and migration changes, with many settlements and structures being abandoned. The reason for this abandonment is still unknown. It has been speculated that war or disease threatened the population. Or, perhaps, floods damaged the canal infrastructure, or maybe drought brought hardship. We will probably never know the reasons why the Hohokam left their home of nearly 1,500 years, but their descendants live on as part of the Tohono O’odham Nation. Today we can visit the ruins of some of the places the Hohokam once called home. Explore the mystery and complexity of an extended network of communities and irrigation canals. 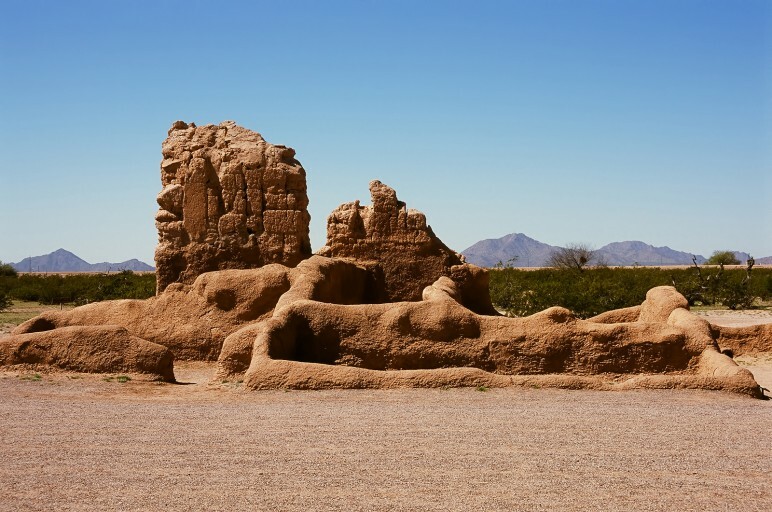 The Hohokam’s farming community and “Great House” are preserved at Casa Grande Ruins. Pueblo Grande Museum is located on a 1,500 year old archaeological site left by the Hohokam culture located just minutes from downtown Phoenix next to Sky Harbor International Airport. This National Historic Landmark and Phoenix Point of Pride has been a part of the City of Phoenix Parks and Recreation Department since 1929, and is the largest preserved archaeological site within Phoenix. A fully accessible 2/3 mile trail takes you through a prehistoric Hohokam archaeological village site with a partially excavated platform mound, ball court, and replicated prehistoric houses. The main gallery of the museum displays artifacts of the Hohokam and discusses the Pueblo Grande village site. Mesa Grande mound was a dramatic symbol of the power of this ancient community. The village surrounding the mound once covered over one-half square mile and was home to perhaps two thousand Hohokam. Situated near the head-gates of one of the two largest networks of irrigation canals created in the prehistoric New World, the site of Mesa Grande controlled over 27,000 acres of highly productive farmland. Today, the streets, homes and businesses of Mesa, Arizona now cover most of the site. Preservation of the mound is due to the community and volunteer efforts already cited, and to the foresight of the City in acquiring the six-acre property. This entry was posted in Arizona farmers and ranchers, AZ History and tagged agriculture, Arizona, Arizona farmers, History, Hohokam, Mesa, museums. Bookmark the permalink.